Figures from the AONB Clwydian Range show that there are nearly 200,000 visitors to Moel Famau every year. 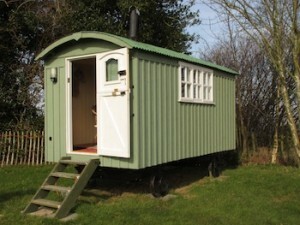 Talentog has been working with the AONB to introduce a Shepherds Hut, similar to one that was used in years gone by, to be used as a refreshment centre and information point so that the visitors can enjoy their visit to look over the Vale of Clwyd even more. Talentog recognise it is important that we preserve everything that visitors enjoy about Moel Famau, so there won’t be generators, but we will be able to offer a nice cup of tea, and a good cup of coffee and locally made cake. Our staff are also working with the AONB so they will know about local conservation projects and the local history. With lots of information about what’s going on in the local area, we are hoping that people will hear more about the local areas and also want to visit the local villages and towns. And there will be a solar charging point for computers and phones to make sure people can take advantage of the AONB digital initiatives… phone tapes of the area are already in place… and digital imagery of the forts and the Jubilee Tower coming soon. We are hoping that once the Hut is up there it will be a Hub for people who love the rural way of life and will be a focal point for some starting up businesses in leisure and creative pursuits, particularly (though not exclusively) for younger people. This sounds interesting and reads as though it is definitely going to happen but don’t you need Planning permission? Or has that already been granted? Yet another nail in the coffin of natural beauty. People should carry flasks and sandwich boxes. Sounds like a fabulous idea, most visitors would love a nice cup of tea and a piece of cake when visiting. Such a shame that you had two negative comments here, when clearly this would offer an alternative to the more permanent and somewhat over priced local cafe!!! Nice to see but empty on the weekend due to many people turning around and leaving because of £2 paring charge !! !